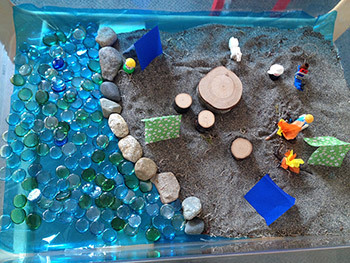 Our daycare / preschool has immediate positions available for both an ECE teacher and an Infant Toddler teacher. We pride ourself on having respectful relationships with our teachers and we offer healthcare, dental, vacations, and competative salaries after the probationary period. Bella Balloon Childcare Centre, previously operating under the name of Happy Days Daycare, has been serving the North Vancouver community for almost 20 years. The theme for this week is the zoo! 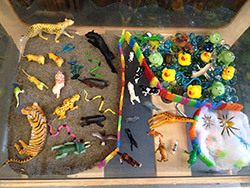 Our preschool teacher set up the sensory table this morning, look at this beautiful zoo she has recreated for our preschoolers to play with. As the week starts, children have colored and cut out zoo animals, who will used in a project further down the week. Keep posted formore projects this week. Our preschoolers are learning about the wonders of camping this week. Ophelia has a great attention for detail and even made a campfire with red atissue paper for flames and cardboard rolls for logs. From the sensory table, circle time learning to a real tent in their room, the children are sure having lots of fun! New deck has been built! Great news! Our new deck has been layed out and is almost ready to be enjoyed! Children will be able to ride their tricycles, tractor and play games on it. Parents can sit on sunny days and wait for their chilrden to get ready. It will be the perfect spot for future daycare BBQ's as well! 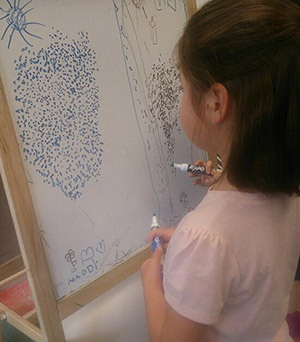 Look at this wonderful work, very impressive for a 5 year old. It requires a lot of patience and concentration. 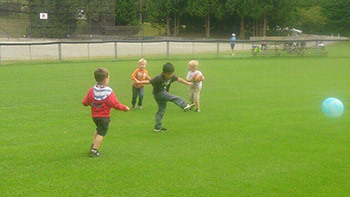 Our preschoolers love going to Westview soccer field. Lots of running and playing ball. Brand new 2,000 square foot playground! We are happy to announce the all new spacious 2,000 square foot playgound. Our children now have lots of room to run, play and have fun! Sunny in the morning and shaded in the afternoon. The play area is divided up into two areas. 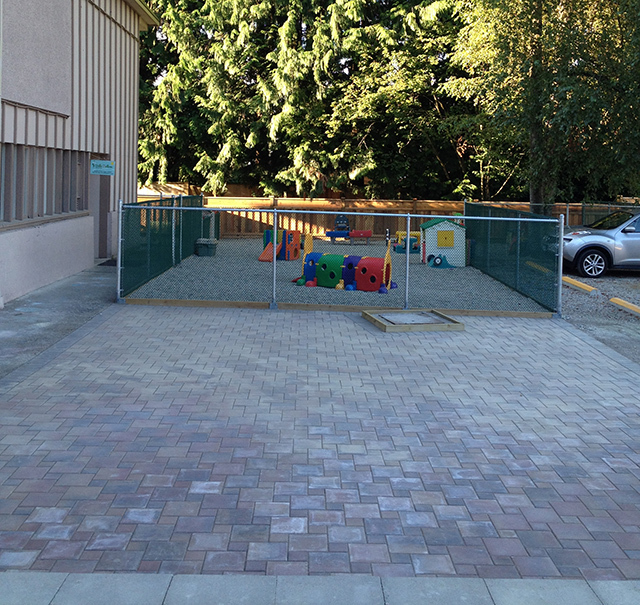 One area for infants & toddlers while is seperate from the preschoolers. 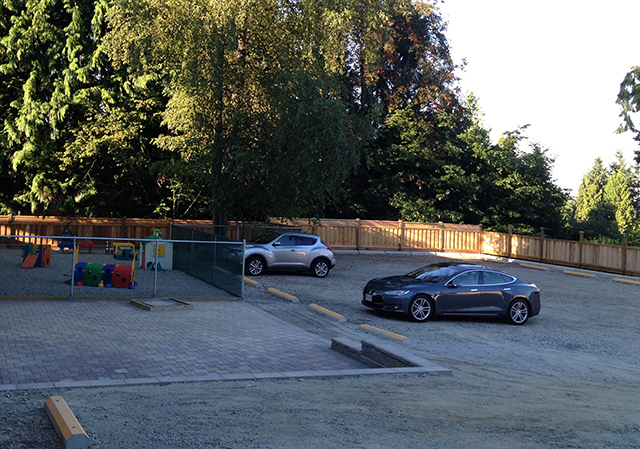 The new parking lot has finally been completed! 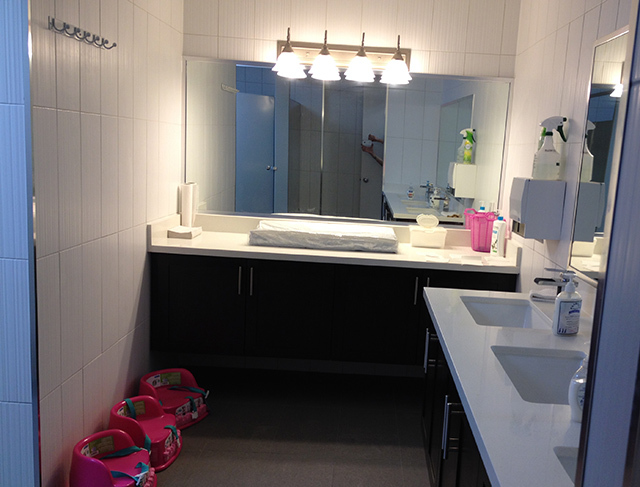 Both bathrooms are fully renovated! We are pleased to announce the completion of the renovations to the boys and girls bathrooms! Blog to keep prospective parents up to date of some of the events and activities that are happing at the centre. Contact section to quickly write feedback or find the location. Registration for registering your child's name at Bella Balloon. 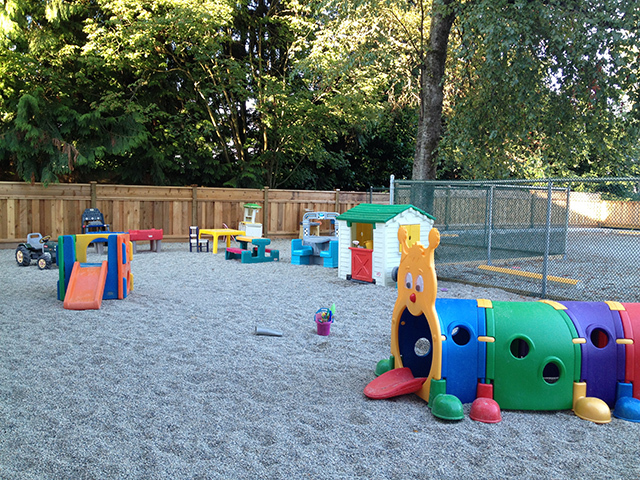 We are happy to announce two big changes for Happy Days Daycare. First off, with a heavy heart we would like to anncounce Mrs. Anna an extremely found farewell as she is retiring. Mrs. Anna lovingly looked after North Vancouver children for over twelve years and it will be hard to see her go altough we are sure she will still visit from time to time to say hello to her Children. Secondly, due to a conflict with the name "Happy Days Daycare" we will be changing the name to "Bella Balloon Childcare Centre". This change also reflects the move to a bigger scope from just a daycare as we will now be offering pre-school and montesori inspired programs.